Thinking he has been moved off to live with his eleventh foster family, Ewan is instead told he is a Lenitnes, one of an ancient race of peoples who can alone see the real ‘Creatures’ which inhabit the earth. He is taken in by Enola, the mysterious sword carrying Grand Master of Firedrake Lyceum, a labyrinth of halls and rooms in the middle of London where other children, just like Ewan, go to learn the ways of the Creatures. I loved this book. I was a huge Harry Potter fan (and my 9-year-old son is a huge fan) and I was a bit disappointed when the series ended. All other books that were written in a similar fashion to Harry Potter, I found boring and unoriginal. 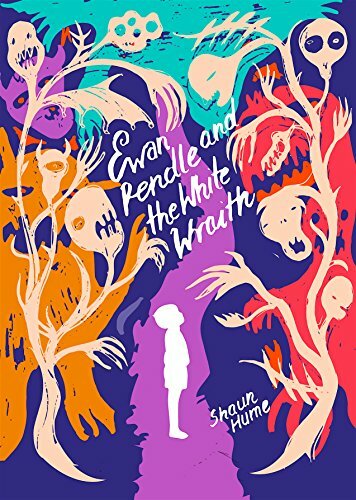 That is until Shaun approached me to review Ewan Pendle and the White Wraith. I was instantly transported to a world, while similar to Harry Potter in ways, it was also very original. Ewan Pendle had been in the foster care system ever since he could remember and he kept getting bounced from foster home to foster home. Why? Because he was weird and he freaked his foster parents out. See, Ewan could see monsters when other people couldn’t. The first monster that he saw was a dragon when he was 5 and they just kept on showing up after that. He was treated with fear and ridicule when he attempted to tell an adult (usually a teacher or his foster parents). After a while, he was labeled as weird and moved when his foster parents couldn’t deal with his weirdness anymore. So when he was told that he was going to another foster family in London, he wasn’t surprised. What he was surprised was when he was met on the train by a woman who held keys to his past and parents. A woman who told him that he was a Lenitnes….a race of people who could see Creatures (aka dragons, wraiths…stuff along those lines). Even more so, he was surprised to find out that he was going to a special school to learn the way of the Creatures. A school called Firedrake Lyceum. A school that is as mysterious as its Grand Master and Masters. At this point, I was liking the book but thinking to myself “very similar to Harry Potter“. But when Ewan was told that he was a Lenitnes and the author explained what that race was, I started loving it. Then the school came up and I thought to myself “Definitely not in the Harry Potter world here.” The world building the author did from that point on was fantastic. Instead of focusing mainly on magic, in this world, you get to choose what clique you wanted to go in. They were Martial (more combat focused), Witches (self-explanatory here), Pyro (they blow things up), Stealth (sneaking), Vanguard (defenders) but the cadets (as the children are called) do not choose until the end of Grade One. Even then, they have to pass basic tests to see if that group is right for them. If not, they stay in Grade One until they pass those tests. It was when Mathilde is showing Ewan around, that I started loving the book. Besides Ewan, I really liked Mathilde and Enid as characters. While they came across one way, I liked that the author had small intros to each girl and I liked how each girl brought out the best in Ewan. Mathilde had an awful past that she is trying to hide. My only complaint was that she kept saying “dude” with every sentence. It drove me up a wall. Other than that, I really liked her and I could understand why she wanted to keep her past from people. At first, I wasn’t too sure about Enid. She was so aloof. But, with the way that the other kids treated her at school, I could see why she was so hesitant to become friends with Ewan. See, Enid was a pirate and she looked different. She had dreds and an eye tattoo that told her people where she stood within their community. Most people would look at her and judge. Not Ewan and it took a few times before she warmed up to him. When she did, she became a friend who stuck by Ewan when school became rough for him. All of the storylines, including the White Wraith one, were very interesting and I loved how the author resolved all but one of them at the end of the book. I also liked that the author did leave it open for a book 2. This is a book that I would have no problem letting my 9-year-old read and I actually plan on ordering it after this review goes live. I read the blurb to him and he is pretty excited about reading it.